Rudyard Kipling's Mowgli came alive in the Uttar Pradesh jungles, when local policemen rescued an eight-year-old girl from a troop of monkeys recently. LUCKNOW: Rudyard Kipling's Mowgli came alive in the jungles of Katraniyaghat in Bahraich district, 200 km from Lucknow, when local policemen rescued an eight-year-old girl from a troop of monkeys recently. The cops had to face resistance from the simians before they could rescue the girl. Mowgli, the man-cub protagonist of Kipling's ‘The Jungle Book’ was reared by wolves’ pack in 'Seeonee hills', now in MP. The girl was spotted when a police party of Motinagar range in Bahariach headed by sub-inspector Suresh Yadav was on routine night patrol in the woods of Katarniyaghat. “We spotted her playing among apes. As we tried to go near the girl, the monkeys surrounded her and some of them pounced on us,” says sub-inspector Yadav. Even the girl also resisted the cops and screeched at them. The girl, without clothes, was significantly comfortable among the apes. She, however, was finally taken out by the police party and immediately admitted to the district hospital. There is no lead about the family or parents of the girl who can neither talk nor can comprehend any language. “She behaves like an ape and screams loudly if doctors try to reach out to her,” says Dr DK Singh, chief medical superintendent, Bahraich District Hospital adding that her behaviour is making her treatment difficult. However, he says that the girl, who has been in the hospital for over two months now, is showing definite improvement in her medical condition. The girl’s presence in the district hospital has evoked curiosity among the locals. “As she sees anyone looking at her even from a distance, she starts growling,” says Shiraz, who is one among those visiting the strange patient in the district hospital regularly. “When she was brought to the hospital, she had wounds all over her body. Her nails and hair were unkempt like monkeys,” says superintendent of police (City) Dinesh Tripathi. “From her behaviour, it appears that she had been with the monkeys since birth. I visit her personally time-to-time,” Tripathi adds. Sharing other details, Dr Singh says that the girl even walks, eats and sits like monkeys. “Sometimes she walks on feet and suddenly comes down on all four,” says the doctor. Even while eating, the girl spreads the eatables on bed and doesn’t use hands to put them in her mouth. 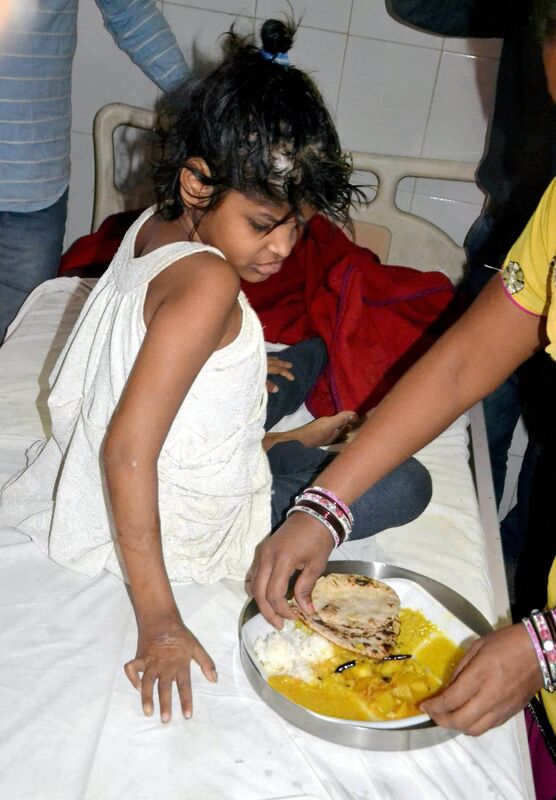 “She uses her mouth to pick the eatables,” says a nurse of Bahraich district hospital. “The treatment is proving to be a difficult task for the doctors as she does not understand anything and makes noises and faces like monkeys, and attacks the doctors when they approach her,” says a junior doctor. According to the hospital staff attending to her, the girl gets scared on seeing human beings and gets violent very often on seeing people looking at her.